I have a colorful combination of interests and life experiences. Born and raised in Germany, it was here where I first discoved my passion for music production, performing and teaching. Living in the UK allowed for depth in my musical experiences, where the people I met and the technology I learned brought new dimensions to my creations. Now in the US, I look forward to new influences that will bring fresh ideas and innovation in my technical and creative work with music and people. I have performed live in a range of venues and events. These include weddings, birthday parties, formal garden season openings, garden parties, charity events, funerals and individual personal celebrations. 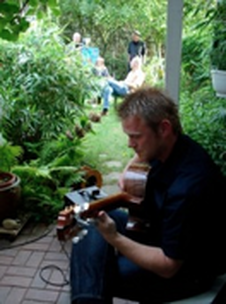 My repertoire includes a range of 4 centuries of classical guitar music. The range, for example, can span from Bach to Beatles. I also perform using modern computer technology to create a deep and rich sound involving a multitude of musical instruments. I have experience in teaching guitar to novice and advanced students for the past 20 years - hundreds of students from ages 5 to 75. I have taught in 3 different countries, from individual lessons to small groups lessons and large group seminars. I am a classically trained guitarist, while I also have extensive experience in teaching electric & acoustic guitar.My goal is to provide the ideal individualized lesson that fits best to the learner and the situation. I would like to address your needs to maximize your success in your musical performance. My approach to each lesson with you is to provide an efficient learning experience. I have the resources and expertise to offer you a wide range of tools that will allow you to appreciate what modern technology has to offer today. For example, did you know that your computer or iPhone or iPad can help you learn in your musical approach and may provide a "fun-factor" that you have never experienced before? The new generation of technology can make a huge difference in outcome and the enjoyment level of your musical experience. I can guide you in the use of this modern technologies if you wish to combine this in your musical instruction. Individual sessions are completely flexible and I will create and organize the lessons around your needs. The first lesson is free, which will enable us to determine what your guitar learning needs are. Individual lessons are 30 minutes long. Please also ask about package discounts. The exact dates will be displayed here on this website. These classes are starter packages to kick start your learning experience. With the completion of this course you will have a good idea of where you would like to go next with your music & guitar. Group classes are limited to 5 students per class. Group lesson packages include 4 sessions of 75 mintutes. Please contact me by phone at 734-255-1032 or email.